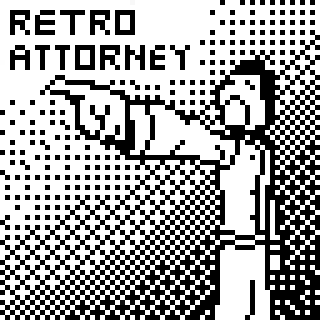 Retro Attorney is intended to be in the style of the Ace Attorney series, but absurdly low-res. The idea was to make a serious drama/satire juxtaposed with presentation that makes no sense. The story is set in the modern day U.S., in an anonymous jurisdiction that is based on the U.S.'s federal jurisdiction, but with a small change (using a hearing instead of a grand jury). As such, the satirical elements make fun of U.S. legal proceedings rather than Japanese like Ace Attorney did. The resolution is 64x64x1 (as in, monochrome). In addition, the game itself uses 8 bytes of memory to store game variables (not including the ones needed to interact with the keyboard and handle the window). All images are drawn manually, and nothing is dynamically handled. Due to how awkward the game's design restrictions were, there's one thing I didn't manage to get across that would be helpful for playing it: the "files" option when used in court doesn't check which statement is current. It instead applies to the whole testimony. I did this because I felt it an unnecessary annoyance to have the player go through and find the statement to present evidence for given that the entire testimony is already supposed to be on the court record. Unzip and run. It's windowed only due to the imposed restrictions, but after the program is run the first time it generates a settings.ini file that can be used to adjust the resolution as needed.